SEOUL, South Korea (AP) — Twin typhoons renewed fears of a humanitarian crisis in North Korea, where poor drainage, widespread deforestation and crumbling infrastructure can turn even a routine rainstorm into a catastrophic flood. Typhoon Bolaven struck the North on Tuesday and Wednesday, submerging houses and roads, ruining thousands of acres of crops and triggering landslides that buried train tracks — scenes that are all too familiar in this disaster-prone nation. A second major storm, Typhoon Tembin, pounded the Korean Peninsula with more rains Thursday before dissipating. 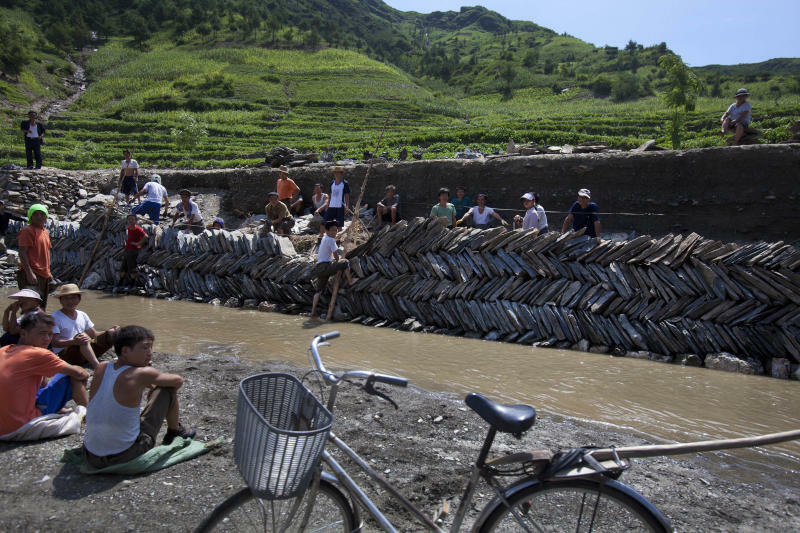 The storms came with North Korea still recovering from earlier floods that killed more than 170 people and destroyed thousands of homes. That in turn followed a springtime drought that was the worst in a century in some areas. The disaster relief group AmeriCares announced late Thursday that enough emergency antibiotics and medical supplies to treat 15,000 North Koreans would be airlifted to the country as early as this week in coordination with North Korean officials. 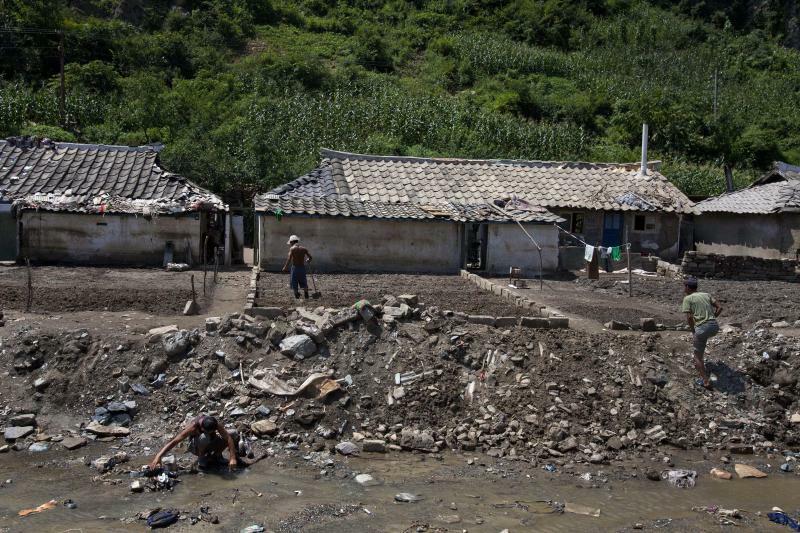 Damage to 69 hospitals and clinics suffered during the earlier floods has left 700,000 North Koreans without access to health care at a time when scores are fighting off the threat of infection while living in temporary shelters, the group said in a statement. Other foreign aid groups said they were standing by in Pyongyang, but had not received new requests for help from the North Korean government. They had little information on the extent of damage and were relying on reports from state media. The country's wariness toward the outside world, as well as a primitive rural road system, means aid may be slow arriving, if it is allowed to come at all. "These fresh storms, coming just a few weeks after the serious flooding — they do raise concerns because we see parts of the countryside battered again that have already been left in a vulnerable state," said Francis Markus, spokesman for the International Federation of Red Cross and Red Crescent Societies in East Asia. Tembin's strong winds and hard rain pounded South Korea on Thursday as residents of some cities waded through streets flooded with murky, knee-deep water. The storm moved off the peninsula's east coast overnight. The national weather agency in Seoul predicted some cities in southern North Korea could see up to 80 mm (3.15 inches) of rain, but North Korea didn't immediately release details on rainfall, deaths or damage from the latest storm. The earlier storm, Bolaven, left 20 people dead or missing in South Korea. It killed three people and left 3,300 people homeless in North Korea, the country's official media reported. Downpours trigger landslides that barrel down the North's deforested mountains. For years, rural people have felled trees to grow crops and for firewood, leaving the landscape barren and heavily eroded. Rivers overflow, submerging crops, inundating roads and engulfing hamlets. Since June, thousands have been left without clean water, electricity and access to food and other supplies. That leads to a risk of water-borne and respiratory diseases and malnutrition, aid workers say. Because the North annually struggles to produce enough food from its rocky, mountainous landscape to feed its 24 million people, a poorly timed natural disaster can easily tip the country into crisis, like the famine in the 1990s that followed a similar succession of devastating storms. 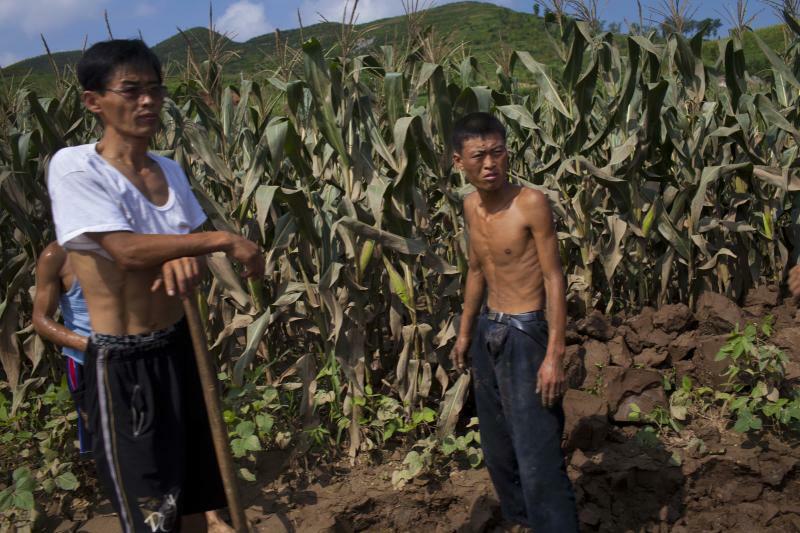 A North Korean land management official acknowledged in an interview with The Associated Press that widespread deforestation and a lack of basic infrastructure have made the country vulnerable to the typhoons and storms that batter the peninsula each year. "It's important for the future of our children to make our country rich and beautiful," Ri Song Il, director of external affairs for the Ministry of Land and Environmental Protection, said in June. He said a campaign is under way to replenish forests, build highways and construct proper irrigation at the order of North Korea's new leader, Kim Jong Un. He held up a green pamphlet on land management that was the first official document Kim published after taking power from his father. But it may be too little, too late, for this year's summer rains. In Pyongyang, North Korea's showcase capital of grand monuments and broad boulevards, the rains have been little more than a nuisance for residents tromping about in rubber boots and umbrellas. Outside the capital, it's a different story. In villages without the luxury of paved roads, summer downpours have sliced through roadways and washed away bridges, all but cutting off already isolated communities from supplies, food and help. Two weeks ago, AP journalists visited a flood-ravaged mining hamlet in South Phyongan province where gushing waters from an earlier storm swallowed a whole block of homes. The trip, a mere 40-mile (60-kilometer) drive northeast of Pyongyang, required a bumpy four-hour ride along rutted, muddy roads. Along the way, workers piled stones along the roadside as a bulwark against landslides, but they were no match for the water rushing down mountainsides. Villagers crouched in makeshift lean-tos and camped on the rubble where their houses once stood. They vowed to rebuild once the roads are restored and trucks can cart in cement. But there are concerns about how vulnerable their new homes would be if they rebuild at the foot of a mountain in the county of Songchon, which means "place where many waters come together." North Korea has no clear long-term strategy to deal with disasters or climate change, the United Nations said in a report issued in June. This year, North Korea is at a particularly dangerous juncture, said the Red Cross' Markus. Over the last two years, he said, "we've been seeing a gradual deterioration in the humanitarian situation." The Red Cross works with villagers to prepare evacuation plans and other ways to protect themselves, their homes and their farmland in the event of a disaster, he said. But severe weather remains an omnipresent threat, and poor infrastructure and massive deforestation are "a major factor in exacerbating these weather events," he said. "There's no doubt that the vulnerabilities in the countryside are considerable." Associated Press writer Foster Klug contributed to this report. Follow Lee, AP's Korea bureau chief, at twitter.com/newsjean and Klug at twitter.com/APKlug.